He thought it was great fun, the little monkey. He’s BIG too, already 3.15 kilos at 5 months. Next will be the TV, I’m sure! Did you get the innocent face “Wuzzen me, I was the other side of the room”, or the devil incarnate “C’mon, what’s the big deal, you hated it anyway”? …. until you don’t produce the food quickly enough? I used to have one of those. A quick swipe round the ankles with her claws as a hurry-up. Not at all! He seems to only get rambunctious later. Or at odd times! Mornings are nice and calm. They have free-choice kibble all the time anyway. But he gets his special chicken at random times. Lucky you 🙂 More kitten photos, please? Well, I’ve got a bunch of broken bits now! And good luck to me finding time to replant it. Oh well. The big momma plant is safe in another location, massive thing! I will! Turning the time of year when I can only look at my houseplants! 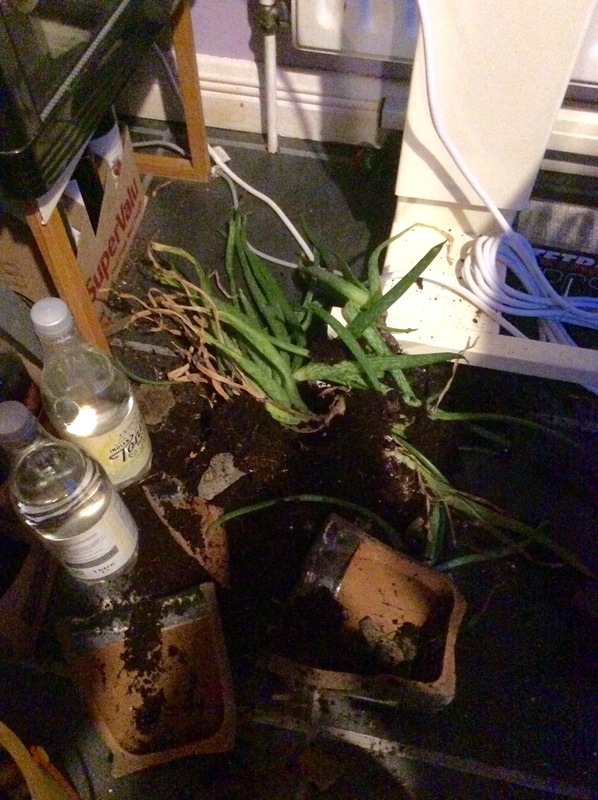 Our ”kitten’ has occasionally knocked over pot plants. It’s a pain in the backside, but what can you do? What a great time he had…the plant didn’t have a great time. And you get to clean it all up! The joys of kittens! Oh well. I like him a lot more than the plant, or the pot it was in!